In my previous post, I talked about the problem of style over substance being a growing problem in the West End at the moment. I fear that Charlie and the Chocolate factory suffers from this malady. It seems, after the success of Matilda, the fat cats have yelled "This is a money spinner, get more Roald Dahl on the stage". I really didn't want to make a comparison to Matilda, but it now seems inevitable. Where Matilda has heart, Charlie has none. It's a treat to look at, make no mistake but, like chocolate bars themselves, what’s pleasing at the time but leaves me feeling empty afterwards. This isn't about the story - Roald Dahl was a fantastic storyteller, that's not where the problem lies. It's more like there's a lack of connection to the core of the story. There's emptiness where the heart should be. I've read interviews with many directors and playwrights, who talk about the process of adapting a story from a book or film into a stage production and the unanimous verdict is, you can't make a carbon copy. That just won't work. You need to find its theatricality, strip the story back to the bare bones and rebuild around its essence in a way that suits the stage. I don't think that's happened here. The story revolves around Charlie Bucket and his acquisition of a special golden ticket to get an exclusive tour of Willy Wonka's chocolate factory, granted only to himself and a few other kids - all of whom are larger than life characters. 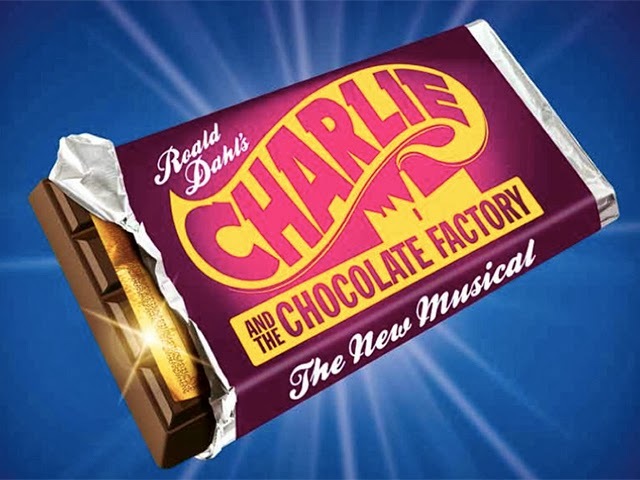 The first act deals with establishing Charlie and his family dynamic, introducing the other children, then finally, right at the end of the first act, Wonka himself is revealed. The second act is entirely set within the wondrous walls of Willie Wonka's chocolate factory. And wondrous the sets are, undeniably. Nothing groundbreaking, but a treat to look at; there’s a palpable excitement as we await the revelation of the next impossible room. Gasps of delight can be heard from the younger audience members as the doors of each room are thrown open and they witness the magic inside. That, at least, is something that cannot be scoffed at. How many kids fall completely in love with theatre at those magical moments? For that, shows like this can be commendable. The second major problem with this show is the new songs - bland and unmemorable. I wonder why they decided to go down this route, when the original songs were so much better? The creators clearly don't have complete confidence in their material, as 'Pure Imagination' still features in the show and is hinted at with the recognisable tinkling of the first few notes every so often, teasing us. The song is strategically saved for the end of the show. The song I had a real problem with was ‘If Your Mother Were Here’, when the mother and father, each in turn sing about how the other would handle the situation of cheering up Charlie if they were there – the problem is ... they were just there! They’re taking it in turns to be with Charlie, and didn’t manage to do ANY of the things the other is imagining. Maybe that’s the point? you ask – well, it isn’t because they already know the other hasn’t succeeded. It is frustrating in its lack of sense. Bring back ‘Cheer Up Charlie’. It may have been on the nose, but at least it made sense. Was this decision to create new songs an artistic one or is this to do with the potential cost of securing the copyright to the entire score? The part of me that's becoming steadily cynical can't help but think the latter. 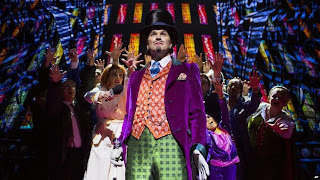 My favourite thing about this production has to be Douglas Hodge as Willie Wonka and the show improves immensely after his entrance. Shame it’s at the end of Act one. In his garish costume of mismatched colours, that somehow manage to match, he plays Wonka with the air of scatter brained, eccentric genius perfectly and has a lovely classic musical theatre voice to boot. This voice is best shown off in ‘Pure Imagination’ and the only song of the new material that I liked – ‘It Must Be Believed to Be Seen’. I’d love to hear him sing something with a bit more musical meat that we’re just not served in this show. The kids in this production, as ever, are also a shining light. Their energy knows no bounds and they're all so in tune with their individual characters, it's impossible to think of them as anyone else. The girl playing Veruca Salt on this occasion (Tia Noakes, I think) was particularly good, right down to the spot-on facial expressions. I would be remiss in not mentioning Jack Costello, our Charlie for the evening. For one on stage so often, he gave an endlessly focused and controlled performance even when not the focus of the scene. I don’t want to condemn this musical. 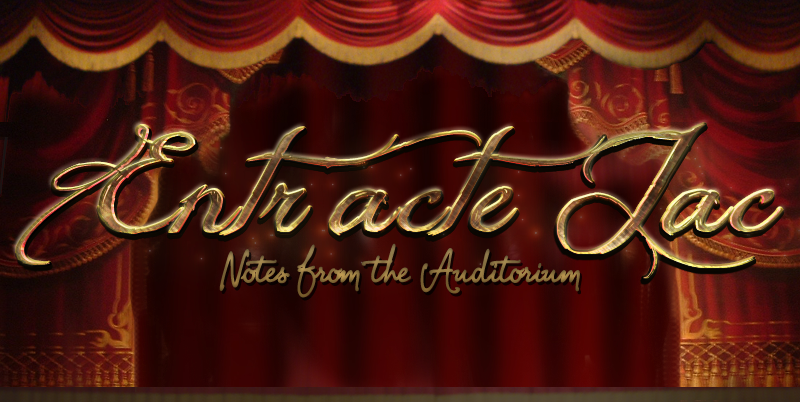 There is some theatrical magic on offer here - in the sets, in the individual performances, in the sense of anticipation. If only the magic had made it into the score and, most importantly, the story. recommended if:- you're looking for a show to entertain rowdy children in an age of many distractions - this will keep them occupied, there's lots to look at and the sense of ‘what will we see next?’ will keep them on the edge of their seat. avoid if:- you are particularly attached to the film version or want a show with memorable tunes and a strong connection to the story. Once intrigued me from the moment I became aware of it. There seemed to be a big, loud buzz about a show that was small, quiet and simple. Completely different from anything the musical theatre world has seen before, it seemed just the tonic for an industry that seems to be suffering from a disease of style over substance. I thought this gentle show would be a perfect choice for my Thursday matinee. 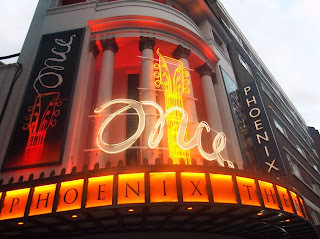 This was my first visit to the Phoenix Theatre. It's an intimate space and reminds me of the Garrick, right down to the soft, intermittent rumbling of the northern line tube running beneath. The auditorium is alive with the sound of music as soon as I step through the doors, 15 minutes before the scheduled start time. Several audience members sit in the midst of an Irish pub set, among whirling violinists, strumming guitarists and percussionist drumming away on the side of wooden boxes. Drinks are being served at the bar onstage. Straight away we are transported to a typical Dublin pub and made to feel like welcome patrons. The jovial, bustling pub seamlessly blends into the beginning of the show proper with a slow dim of the house lights as guy takes the stand and throws himself into his first, heartfelt song 'Leave'. The story, adapted for stage by irish playwright Enda Walsh, revolves around two people who randomly meet. We never know their names. They are known simply as 'Guy' and 'Girl'. Guys life has come to a halt, he's in a rut and just about ready to give up on music. Then Girl breezes into his life and turns it all around in a matter of days. They develop a quick, strong connection through music and this is the real locus of the story - in the words of Markéta Irglová:- "you can be a total stranger to somebody, and they can be a stranger to you, and yet when you start playing music together... there's something that happens where it's almost like your souls merge"
The songs in the show are all written by songwriting duo Glen Hansard and Markéta Irglová. Hansard, like Guy, is Irish and Irglova, like Girl, is a czech native and this show was born out of their shared experience of creating music. The result of their combined input is a folksy/indie kind of music, reminiscent of Mumford and Sons, that cuts straight to the heart and soul without any grandeur. The complete antithesis of the stereotypical idea of showtunes. There are no set changes during this performance. To match the simplicity of the story the designers were keen to keep the set understated. The different locales are implied by the placement of the pub chairs & tables and through Natasha Katz's lighting design. The placement of a mirror over the bar is a really nice touch, allowing us to see angles that would otherwise be denied - watching Girl's hands play the notes of the piano feels like we've been permitted special access into a personal moment. From the moment Declan Bennett sets foot on stage, in the role of Guy, he gives off an intense, melancholy presence but a presence that certainly dominates the stage in an understated way. It's impossible to dislike Girl, as portrayed by Zrinka Cvitešić, she brings a charm to the role that makes you want her as a friend. Her character encourages and pushes Guy toward his dream and yet, she has her own fragilities that she must try to deal with. The rest of the cast all help to create the warm, comforting atmosphere of the show, touching on the lives of the two central characters all the way through. Ryan Fletcher as Svec provided the ridiculousness to lighten the heavier moments, as well as Tim Parker who was on as the character of Billy in this performance. For me, the song highlights are Say It To Me Now (wish it was a bit longer), Leave, The Hill and, of course, Falling Slowly. Once is a whisper of a love story. 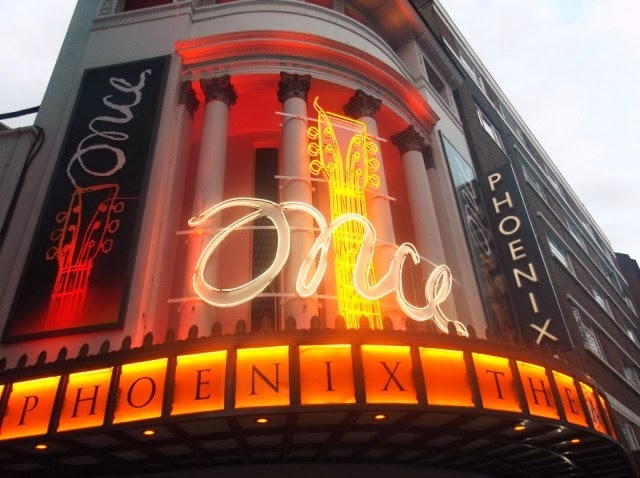 It creeps up on you without a big announcement, you barely even notice it's there, until you're choking back that lump in your throat during the nostalgic reprisal of 'Falling Slowly'. There's a wrenching feeling that this song that began their quiet love is now their parting song and that this particular tale is without conclusion. The pathos of a love story that was never even allowed to begin. For more information, or to book tickets, please visit the official website. I have to mention the programme for this show, which is well worth the money. My programmes for the other 2 shows I saw are identical apart from the actual show information. But the programme for Once looks like someone has put thought into what the audience might like to see in it and there is more show related content than adverts, unlike my other programmes on this occasion; Another disappointing indicator of the money grabbing nature of many other shows on the West End at the moment. Copywrite Jaclyn Martin 2012. Powered by Blogger.